I appreciate your nice comment Adel. Thank you! 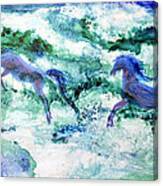 "Sea Horses" is a watercolor by Joan Hartenstein.This painting has lots of action and movement. Painting on Yupo allows free and smooth application of paint. Since this was painted on translucent Yupo, the horses were painted on the reverse side. They really look like they are jumping through the waves.